On the faces you can see eyes, mouth and a beak – a hooked beak, and it’s hollowed through. It must be made of Dall sheep horn. It looks like a grease dish, that’s probably what gave it that dark brown color, and then over time, the aging. 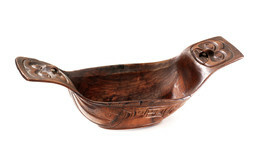 This dish for serving sea mammal or fish oil was made from the horn of a mountain (Dall) sheep. The horn was boiled, molded, and carved by traditional techniques. Images of owls or hawks appear on the ends. Speaking of these faces, Donald Gregory said, “If you look it has eyes and eyebrows like a human; when I first saw this sitting on a table, I thought it was a spirit.” Elder Peter Jack suggested that the fine carving meant the dish was probably reserved for special occasions or honored guests. Clarence Jackson: Good one. Really fine. Looks like a horn, but I think it’s wood. . . . Really finely carved. Donald Gregory: Oh, you know what Uncle? This is a horn. George Ramos: That’s a horn right across there. Delores Churchill: It is, it’s a horn. Just the weight of it, you can feel how heavy it is. Donald Gregory: It’s made out of horn, because it doesn’t have grain. And it has highlights in it, if you look at this here, how dark it is, when you hold it up and move it, it has highlights. . . The carving is shallow, it’s not super shallow, but it’s shallow like the other Tlingit carvings from the same time period. On the faces you can see that it’s got the eyes, the mouth and a beak, a hooked beak actually, and it’s hollowed through. Must have been from a Dall sheep? Clarence Jackson: Must have been. Donald Gregory: And just the use, it looks like a grease dish for eating is what probably what gave it that darker brown for color, and then over time the aging. I never worked with horn but I know that they used to have to boil it and carve it while it was still soft. Delores Churchill: There are some men in our village doing horn spoons with cow horns. They have molds for it. They would heat it, and they just rubbed it against the spoon, and then it would take the shape of the spoon. And then when they were through heating it, they would wrap it around so that it would stay that way as it cooled. Donald Gregory: In the mold? Delores Churchill: Yes, in the mold. Donald Gregory: I think what they do is they can carve it first. And the second stage is when they’re shaping it. They boil it to get it in that shape. And they had, like you said, they had forms that fit in, and then something else that went into it. Delores Churchill: Right, it held it together. . . .
Peter Jack: That’s probably for special occasions, because I have a spoon that was given to me by my father-in-law and there’s nothing on it. Real nice form spoon about that big [eight inches] handle, sheep horn. No carving or anything, so that was just for ordinary use. But for all that carving on it, has to be for special occasions, maybe a special guest. Donald Gregory: It doesn’t have any distinctive design on the bottom side or the design underneath. It looks like they did a lot of filling. Delores Churchill: The u-shapes are squarish. But that was pretty common wasn’t during that era. Donald Gregory: Yes. It’s just like with Chilkat blankets, that when they started doing those designs, that’s how they used to do all the designs back when they first created the blankets. When they started and they never changed. Clarence Jackson: Dzisk’w. There’s no owl clan in Sitka. Donald Gregory: My first instinct was it’s not an owl. But I didn’t want to say that if that’s what they identified it when they bought it. Looks like a hawk’s beak, and it’s got a mouth. Clarence Jackson: Hawk would be Daklaweidi [Killer Whale Clan]. What do the other designs depict? Donald Gregory: On the bottom side it could be a wing. And down here I’m not sure what that represents, if that’s supposed to be a tail. But this definitely can represent a wing.
. . . And if you look at this beak that’s carved on there, it looks like a hawk’s beak and it has different eyes than what I would guess an owl would have. I would think he would have more rounded orbs as opposed to these ones that are carved in here. Rosita Worl: Yes, it looks like it’s a hawk. Donald Gregory: Just because the beak is so hooked. Rosita Worl: And the eyes. Donald Gregory: . . . And it’s strange that here it has a mouth with lips and a beak. If you look, it has eyes and eyebrows like a human. When I first saw this when it was sitting on a table, I thought it was a spirit. . . . Holding it to the light and looking through it, . . . you can see the eyes through it. Clarence Jackson: Yes. That’s art, real art.